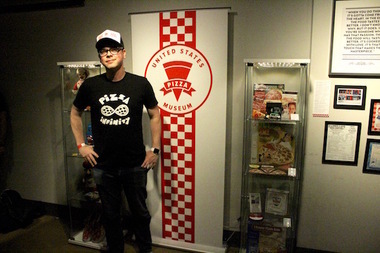 U.S. Pizza Museum curator Kendall Bruns stands beside the first live exhibit of his collection at the Chicago Pizza Summit on April 3. BUCKTOWN — Now that the U.S. Pizza Museum has marked its official Chicago debut, its creator is branching out into live performances. Next Wednesday, June 15, Dimo's Pizza Six Corners will host a night of comedy, music and "delicious pizza stories" all centered around cheese, crust and sauce. "A Slice of Life" will be free to everyone who patronizes Dimo's, 1615 N. Damen Ave., and offers a lineup pizza-loving people who will "share their personal stories about how pizza has impacted their lives," according to a Tuesday news release. The event is being jointly sponsored by Kendall Bruns, the founder and purveyor of the newly-minted, Chicago-based U.S. Pizza Museum. 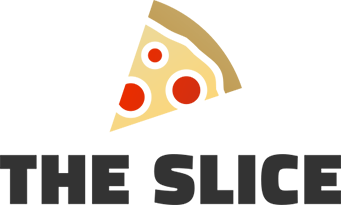 Bruns' collection, which lives permanently online, is vast and varied. It includes hundreds of items including historical postcards, menus from pizza joints around the country, and a VHS copy of the 1988 film "Mystic Pizza." The museum offered its first in-person exhibit in April, at First Ward Chop Shop's Chicago Pizza Summit. Speaking then, Bruns called the hodgepodge of memorabilia a "deliberate mix of high and low art" to celebrate what he called a "great cultural unifier." "A Slice of Life" is scheduled to begin at 8 p.m. on June 15. How Well Do You Know Chicago Pizza?